What to do with this paste? Hamantaschen, the triangular cookie filled with poppy seeds that Jewish people eat at Purim, came to mind of course. But given that Purim is a good three months away, it didn’t seem the most appropriate use right now. The result? 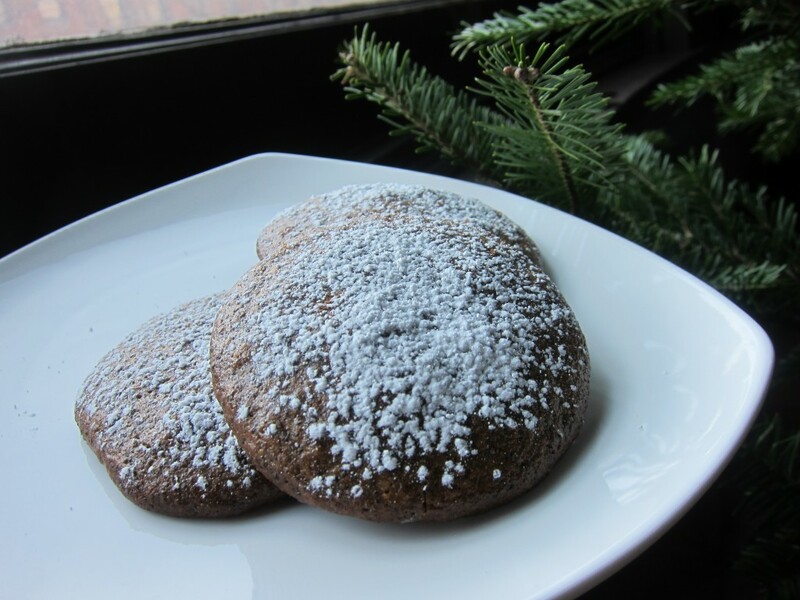 A chewy, slightly cake-like cookie that packed a punch on its own but tasted even better with a festive sprinkling of confectioner’s sugar. One bite of these will send you looking for a tall glass of cold milk as a pairing. In a large bowl, combine poppy seed filling and eggs. Using a hand mixer, beat until well combined. Add all remaining ingredients except confectioners’ sugar, mixing thoroughly. Cookie dough will be very liquid — do not be alarmed. Scoop cookie dough — each cookie should comprise a generous tablespoon of dough — onto parchment-lined baking sheets. Bake until cookies are golden brown, about 18 to 20 minutes. (If you want a softer, chewy cookie, do 18 — if you like it crispier, you can put them in for 20 to 22 minutes.) Remove immediately and cool on rack. This entry was posted in Baking, Cookies, Dessert, Holidays, Sweets and tagged Cookies, Holiday, Lithuanian, Poppy Seed by Cheryl. Bookmark the permalink. Yum! I’m going to try making these. I’m in Professor Karen Springen’s magazine feature writing class at Medill and I just ordered your book on Amazon! I’m excited to Skype with you in February. Hi Amber, looking forward to Skyping with you, too! Let me know how your cookies turn out…Cheers. Wow! I’m sorry I didn’t spot this before Christmas – my husband is part Lithuanian. I’ll save it for Valentine’s Day. But I’m curious about the dried lemon and orange peel. Do you dry it yourself? Or is it available pre-dried? Hi there — the dried lemon and orange peel are purely optional. (They’re additions I made. I did like the taste of them in it, though!) But if you want to add them, sprinkle it into the dough and make sure it’s mixed in well. Good luck! Let me know how your visitor likes them! They were a hit! He couldn’t believe I made them! Thanks.